When snow blankets the Vail Golf Club, it becomes the full-service Vail Nordic Center. Glide along 17 kilometers of daily-groomed skate and classic track, or snowshoe on 10 kilometers of scenic trails. The exceptional staff offers daily lessons on classic and skate skiing and specialty clinics on technique and tuning for adults and children, plus a wide variety of rental equipment is available. 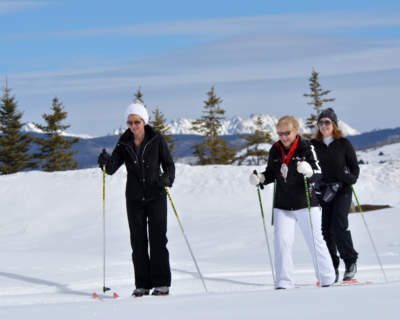 The Nordic Center is open daily from 9 a.m. to 5 p.m. during the winter season. Check out our 13K of fat bike trails and fat bike rentals! Located just adjacent to the Timber Hearth Grille, rental equipment and expert ski instructors are at your beckon call within the Cordillera Nordic Center. Explore the many trails and be assured you will thoroughly enjoy your day in the snow. 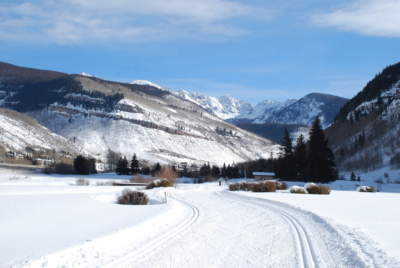 Cordillera offers Nordic skiing and snowshoeing six days a week from mid-December through March. Trails are open every day except Monday from 9am – 4pm. Dogs are only allowed on the snowshoe trail. Hot chocolate, water and snacks are available. 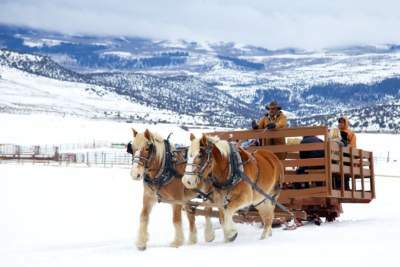 Crisp mountain air, star-lit skies, and a horse-drawn sleigh all await you at 4 Eagle Ranch. Your evening will begin at 6:00 pm and will conclude at 8:30 pm. When you first arrive, you may choose to enjoy a warm drink and a bowl of Juan’s famous chili before snuggling under cozy blankets for an unforgettable sleigh ride beneath wide open, star-lit skies. When you return, an authentic ranch dinner will be waiting for you with some of the finest cooking this side of the Continental Divide. Nestled in the Squaw Creek Valley in Cordillera, 15 minutes west of Beaver Creek, Colorado, Bearcat’s Cabin is the original cabin the Bearden family homesteaded during the early 20th century. Open Tuesday-Saturday evenings from December through April, and seven days a week through the Christmas/New Year holiday. Each sleigh seats up to 14 guests. 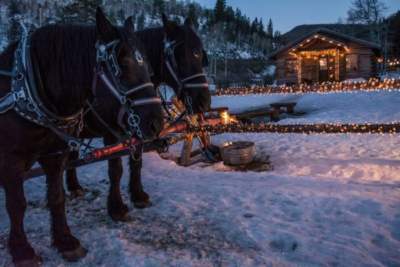 You and your family are invited to tour these historic grounds via Horse and Sleigh while sipping on your favorite beverage. Enjoy a delicious dinner right after! Sure, Vail is world-renowned for its skiing and snowboarding, but the Vail Valley offers plenty beyond vast bowls of bluebird powder days and grippin' groomers. Off the mountain and on the trail, find snowmobiling through Sage Outdoor Adventures or take a historical ride with Nova Guides. In the Vail Valley, eating isn't merely sustenance - it's an important part of the lifestyle. From fine dining hotspots to casual comforts, it's not hard to find great food. Colorado is known for their locals breweries, distilleries and even wineries. Come sample a taste of Colorado and even international spirit favorites. Ski terrain and wonderful snow put the Vail Valley on the map, but it's more than just a ski resort. The calendar is packed with events that are a big part of the Vail Valley's culture. Find events and live music around the time of your stay. © Copyright 2014 Vail Valley Partnership.